Robo-Sauce starts out as a mere picture book, then – with a few paper folds and a little imagination – transforms into a ROBOT picture book. The story starts out normally enough – when a boy can’t get enough of pretending to be a robot, he wishes for a potion that will actually turn him into one. And what do you know? The off-camera narrator happens to have the recipe for just such a potion. After dousing himself in the day-glo orange “robo-sauce,” the boy becomes a rather jerky and destructive robot – punching down a fruit stand with his robo-fist and blasting open a water tower with his laser eyes. When the startled narrator tries to offer the antidote to robo-sauce, the robo-boy promptly disintegrates it, then proceeds to slosh the noxious liquid all over his family, dog, friends, and pretty much anything else in sight. EVERYTHING transforms into a robot, and when the robo-sauce inevitably seeps over the words in the story, even the book turns into a robot. A page folds out, and instructs readers how to re-fold it to activate the robo-book. The larger fold-out page essentially turns into an alternate book jacket, and the last few pages in the story are full of beeps, boops, and, of course, robots. But one final page turn reveals that all the shenanigans were the result of one family’s afternoon of imaginative play. 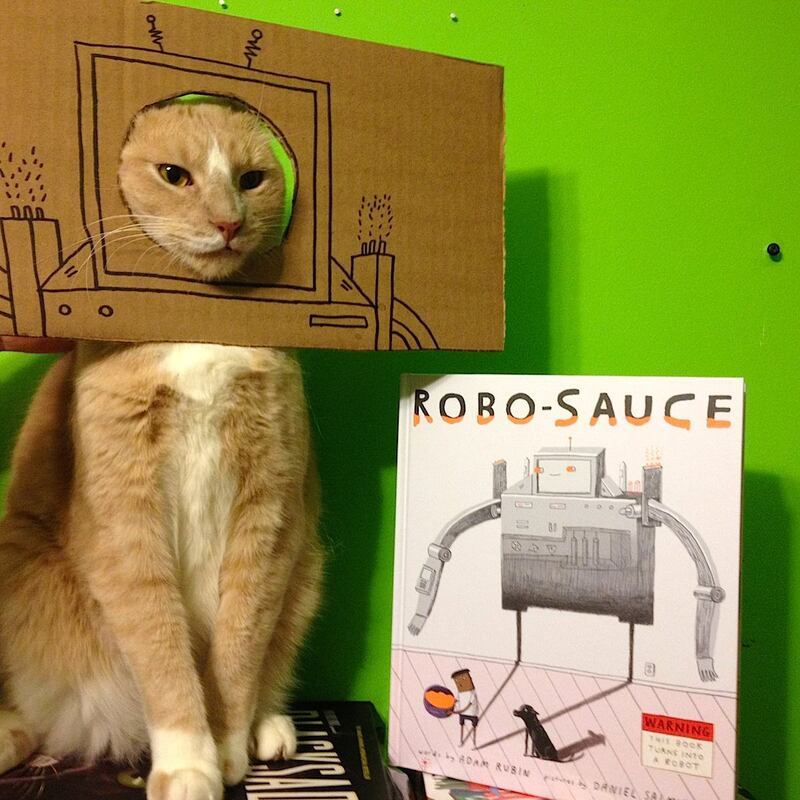 Robo-Sauce is a brilliant twist on both storytelling and book design. Rubin fools readers into thinking the story is headed in a predictable direction (the boy realizes he misses being human and takes the antidote), but then turns the story on its head by having the robo-boy destroy the antidote recipe. The unseen narrator provides considerable comic relief with his mounting alarm as the story careens off-course. Daniel Salmieri’s illustrations are delightful – loose and scribbly – and astute readers will pick up on details that add humor and substance to the story. Take a look at the cover – at a glance, it appears to be a giant robot looming over a boy. But closer inspection reveals that the robot is actually the boy’s shadow, which is a nice bit of foreshadowing (no pun intended). The fold-out page that transforms the book into a robot is a simple yet ingenious bit of book design. Kids will love this detail, and – whether intentional or not – this book is an homage to the power of physical books to delight and amaze. Indeed, I don’t think I’ve been quite as delighted by any other picture book in the past year. I think other readers who pick up Robo-Sauce will agree.